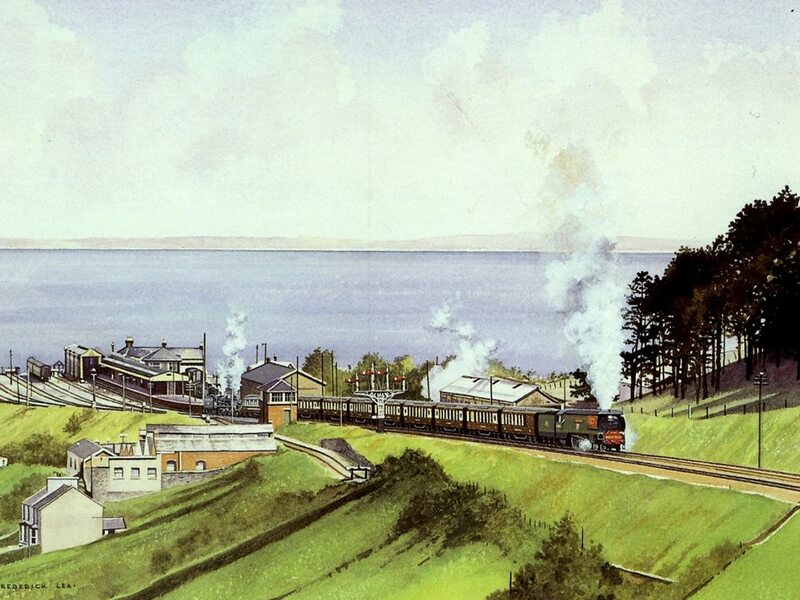 The Ilfracombe-Barnstaple line was opened in 1874 by the London and South Western Railway. The line closed in 1970, and an attempt to buy the line for preservation in 1975 was unsuccessful. Much of the former trackbed has now been developed as the popular and attractive Tarka Trail cycle path. The Wikipedia article on the line contains suggestions for further reading. The Ilfracombe line began its journey at Barnstaple Junction station, the station that younger readers know today as plain “Barnstaple” – the end of the branch line from Exeter. Back then, this was where not only the Ilfracombe line joined but also the line to Bideford and Torrington and also the cross-country line to Taunton. Barnstaple Junction station was always a hive of activity, with frequent trains arriving from London Waterloo via Exeter, and dividing, with some coaches going to Bideford and Torrington and the main part going to Ilfracombe. On leaving Barnstaple Junction, our train took a sharp right-hand curve passing beneath the old bridge carrying the road out of town and up Sticklepath hill. The line eventually came alongside the road just before it crossed the long bridge into the town centre, and the railway took a tight left-hand curve through 90 degrees on its own bridge to cross the river Taw. After a few hundred yards we arrive at Barnstaple Town station. Although this station was simple enough, with just the one platform for Ilfracombe line trains, it also formed a terminus for the Lynton and Barnstaple narrow guage railway (1898-1935.) After leaving the station, the train would cross the river Yeo at Pottington on a swing bridge. The bridge had to swing open to give access to Rolles Quay for small coastal vessels. After crossing Pottington swing bridge, the line became double track for the rest of the journey to Ilfracombe. For the first few miles the line ran alongside the river Taw on what is now the Tarka Trail before cutting inland for a short way to Wrafton station, a simple station with one siding. The line than carried on for about another mile to Braunton. Braunton was particularly busy in the summer as passengers would alight to visit Saunton Sands and Croyde Bay; but it was also interesting because it was the start of the long climb to Mortehoe and Woolacombe station, which was 6 miles away but 600 feet higher. This meant all but the lightest of trains had to be “banked”, which was a case of a second engine pushing from the rear to assist the main engine. At Mortehoe the banking engine would normally leave the train and head back down to Braunton to assist another train. Our train would leave Braunton running alongside the river Caen and the main road to llfracombe, and make its way up the beautiful “Hidden Valley”, climbing hard at gradients of around 1 in 40. Once the valley opens out, the railway veered off left, leaving the road and still climbing hard, and headed accross the fields to Willingcott level crossing before continuing the climb through lonely countryside to the summit at Mortehoe and Woolacombe station. Like Braunton, Mortehoe was also a busy place, particularly in the summer. The station was the point where the banking engines would come off the rear of the trains from both Braunton and from the back of trains that had just climbed the even steeper gradient from Ilfracombe. This gradient was 1 in 36 from the platform end at Ilfracombe until Mortehoe – one of the steepest climbs anywhere on Britain’s main-line rail network. So we leave Mortehoe station and start the 3-mile descent to Ilfracombe, along the Slade Valley and past the Slade reservoirs and the 69 yard-long Slade tunnels before seeing Ilfracombe station perched high above the town. For those lucky to have travelled all the way from London Waterloo on the Atlantic Coast Express, or the Devon Belle Pullman, or any other of the many trains of the Southern Railway’s magnificent main line, this was journey’s end – 226 miles and 39 chains from the platform ends at Waterloo.